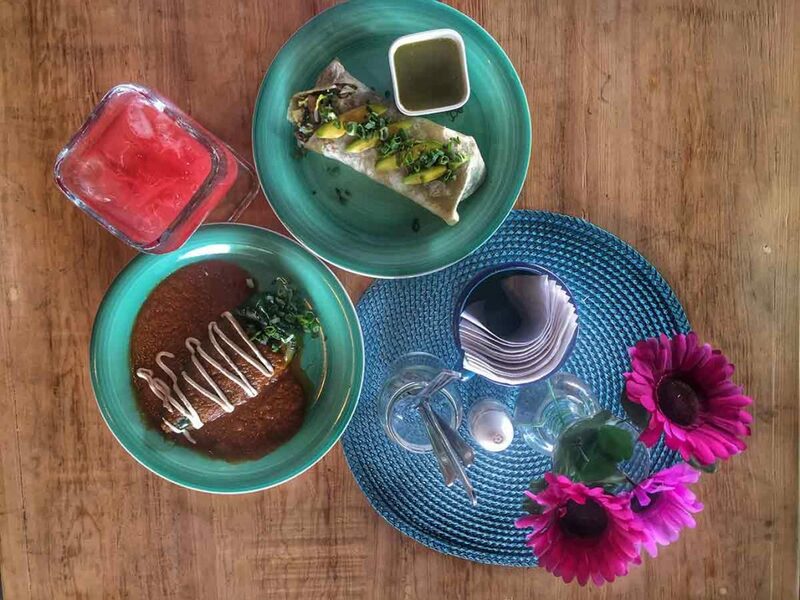 Puerto Vallarta has been a sweet surprise in so many ways, one of which was the culinary offer the city boasts. 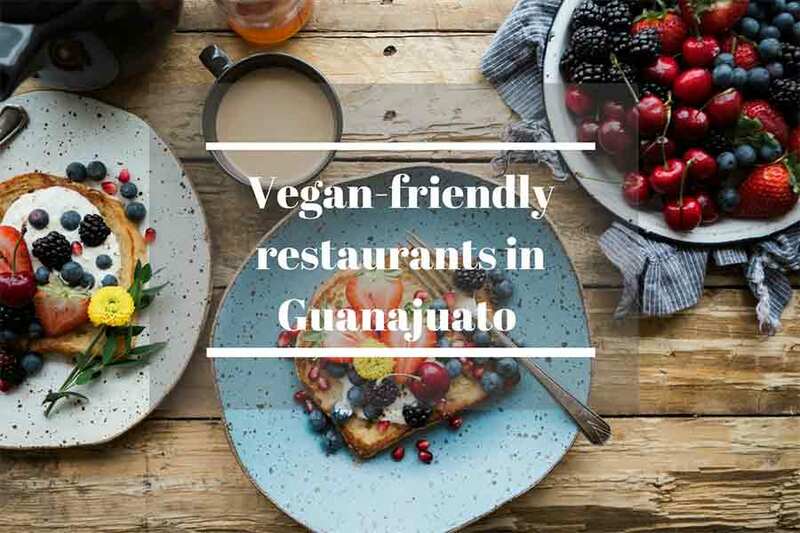 You will find such a variety of restaurants for every kind of palates and many of them would almost always have a vegan option. I have searched for real vegan and vegetarian ones though and tried many of them. 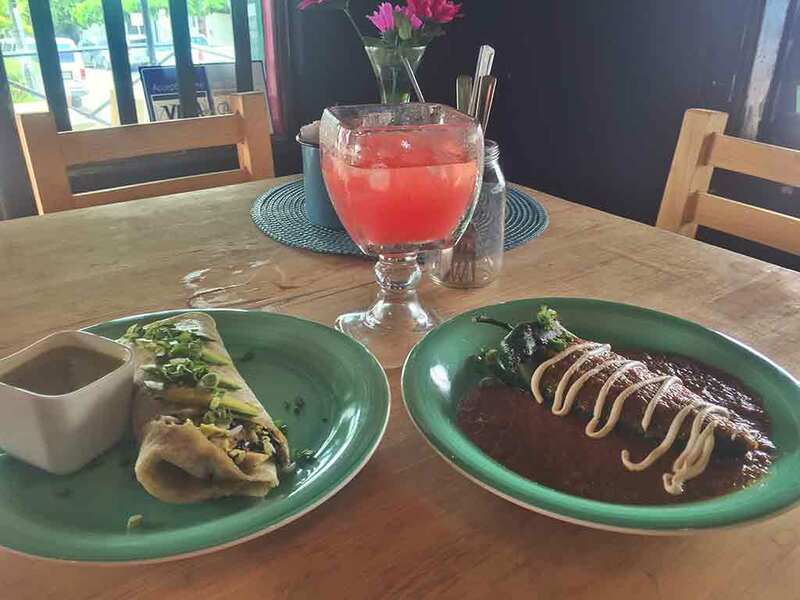 Therefore I am offering here my reviews with the hope to help you find your way around Puerto Vallarta restaurants if you are a plant-based eater. 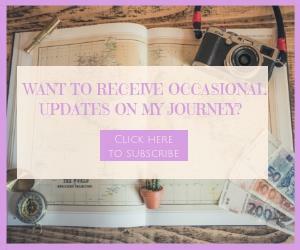 SIDE NOTE – I have absolutely no affiliations relationship with the mentioned restaurants and my reviews are based exclusively on my personal opinion and experience, as usual. 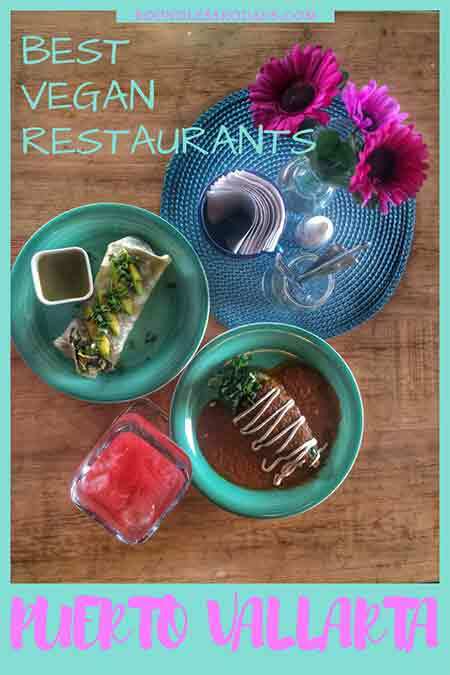 Rich (very) menu with real and elaborate vegan dishes that are not a simple salad or guacamole. I just couldn’t make up my mind. We ended up choosing two different plates and share them just to try different things. The agua de la Casa (freshly homemade watermelon juice) was great too. Great service, the young girl who attended us was just looking sincerely happy to have us there. This is priceless. Lovely creative place, and very breezy most of all, with this heat. The mandala painted wall gave such a cozy and cool feeling to the place, such as the wooden tables and chairs and the whole layout. I just hope they will add deserts soon… they will be amazing like the rest of the food. I will certainly be back before leaving PV. The only small negative note is that it is located in a very busy corner of Puerto Vallarta with a lot of noise from the busses and cars passing by. But it’s really a little downside. Open every day except Monday from 12 to 8 pm. Another delicious new kid on the block. 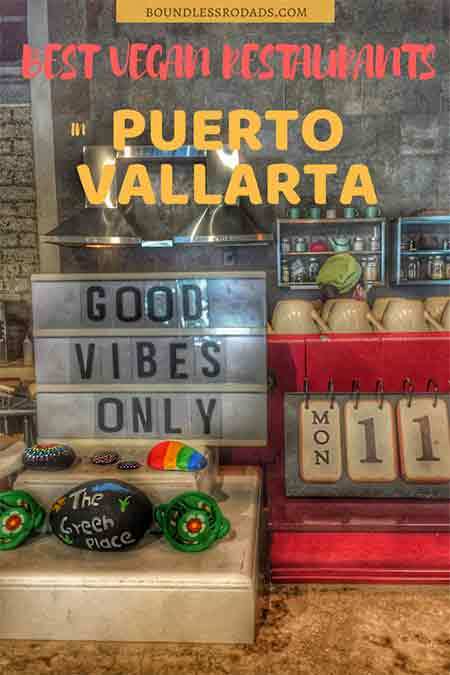 It seems to me that Puerto Vallarta is getting more and more sensitive to healthy food and vegan eaters, which I like. 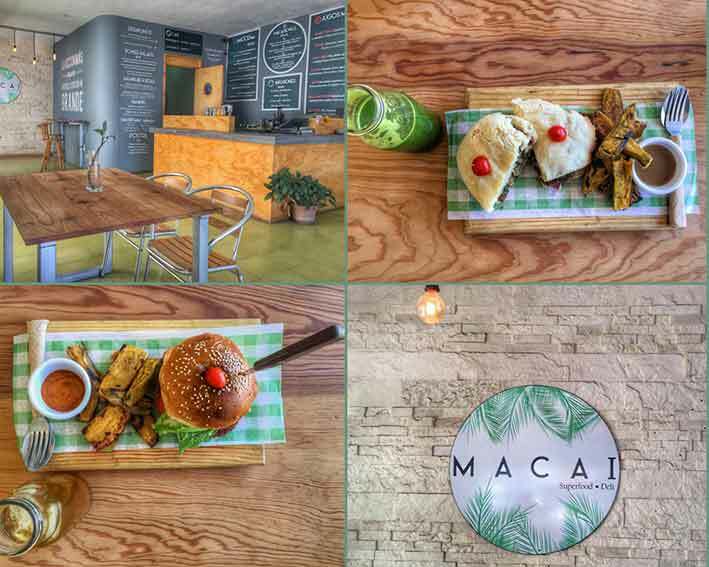 This tiny restaurant is a jewel among the vegan places, located close to the hotel zone and the shopping centers. It’s not really an area where you just go and walk around but it’s totally worth going just for this cozy and healthy deli. The space is relatively small but looks fresh and breezy. They offer a good choice of smoothies and juices, salads and nice burgers and sandwiches with a quinoa base and all sorts of veggies in a joyful combination of tastes and colors. The burgers or paninis can be combined with roasted potatoes or sweet potatoes. I haven’t tried the desserts yet, but those are vegan as well and I will definitely have to go back and try them. A beautiful spacious room with huge tables and comfortable chairs, looking like a working space. It’s actually a delight for all your senses. While eating your healthy meal you can admire works of art hanging on the walls. You might like it or not but it certainly gives a cozy feeling to the open space. The exposition changes every couple of months. 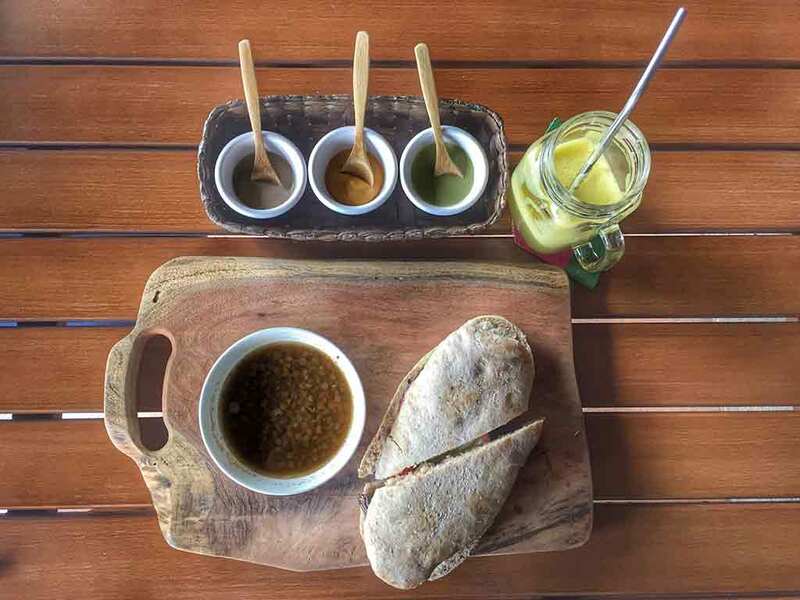 The menu doesn’t offer elaborate dishes but it has a good variety of salads and sandwiches made with different kinds of bread of your choice and is served in lovely wooden trays. The sandwiches come with a lentil or vegetable soup of your choice. We had the portobello burger but in a sandwich multigrain bread and it came with 3 different types of sauce for us to try. Delicious. They offer a vegan cheese option as well, which is nice. They have also a huge variety of smoothies as well made with superfood, nuts, veggies, and fruits with a lot of creative combinations. 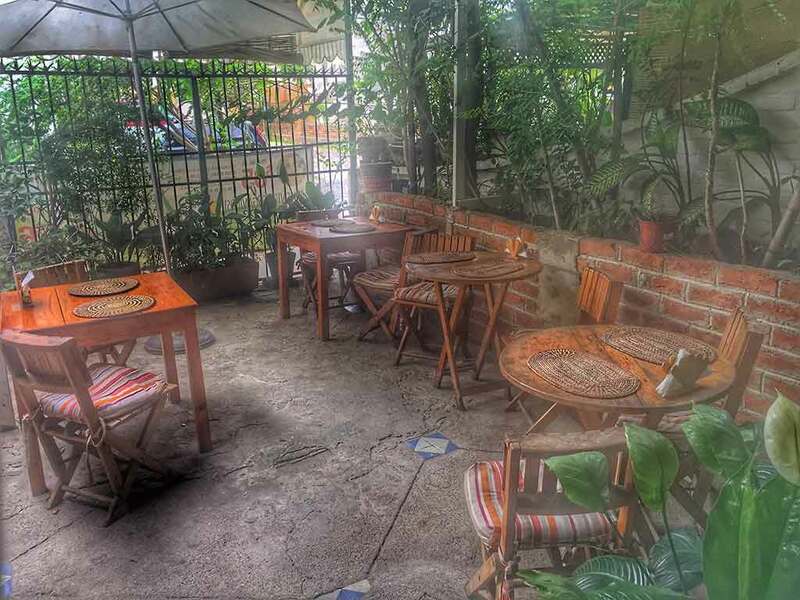 The place has very good vibes and the owner Sahara is a great host and loves to come to your table and promote her culinary specialties, and loves to speak English ;). Everybody, there has a welcoming smile a kind word for you. It’s definitely one place where I will want to go back and try different desserts or smoothies. They open from 8 am to 4 pm and take only cash payment (or PayPal). As much as Pinche Vegano which I have praised already, also Playa Detox is absolutely among the few authentic Vegan restaurants that I know. And to gain extra points they even have many RAW Vegan dishes. I have found Playa detox much more focused on health besides taste and this is something I always appreciate very much. 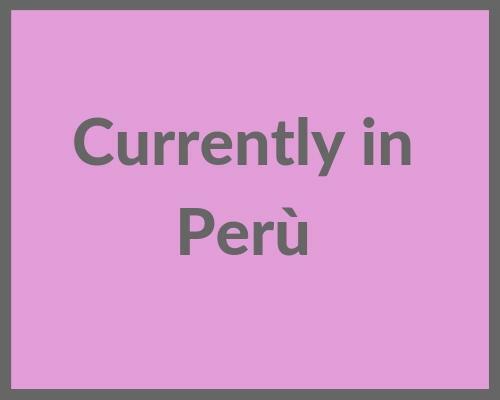 The only less positive element is that it is a bit further from the normally frequented area and If you don’t have a car you might have to walk a little in the sun in order to get there or grab a taxi. It’s totally worth it anyway. The delicious and delicate plates make you want to come back over and over in order to try everything. Since I was almost sure that I wouldn’t have the time to go back I believe I have exaggerated in ordering. But I wanted to try as much as I can and everything seemed so inviting. I had a coconut “ceviche”, some tacos (made with cabbage) and the dessert. I left the place that I thought I was about to explode but as always happens when you eat well (vegan) after half an hour you feel fine and full of energy, with your palate fully satisfied. This is what happens to me at least. I absolutely loved it but make sure when you go there you are super hungry. In fact it’s a buffet only restaurants and they have such a variety of plates that you need to really be hungry to try them all. And they are all delicious. It’s the demonstration that you can really be creative and eat vegan without missing great flavors. The combinations of vegetables with so many different dressings make it an outburst of colors and flavors too. The buffet is a joy to look at but also to eat. They call themselves vegetarian because sometimes they use cream or yogurt for the dressing but they are 90 % vegan if not more. If you are vegan, to make sure, always ask before creating your plate. 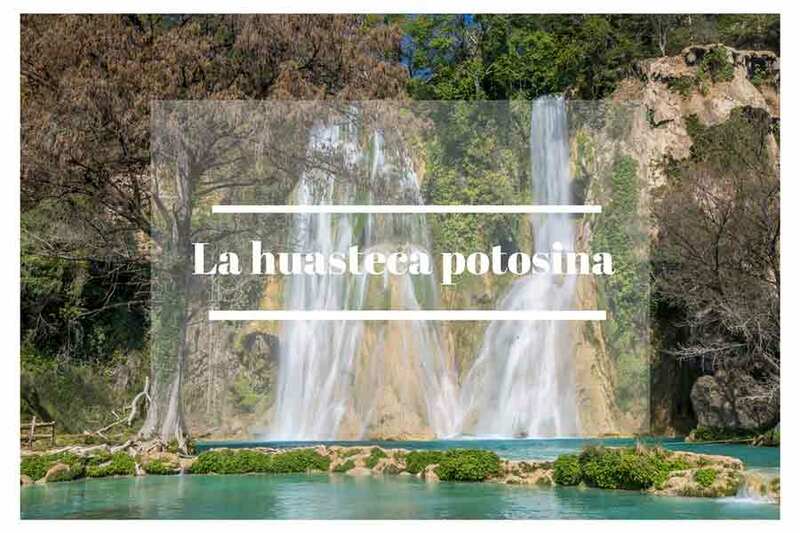 The personnel is very kind and friendly and the place, although not pretentious is really colorful and cozy with nature-themed paintings all over the walls. The place is really cozy and fresh, and service very attentive. I went with my lovely doggie girl whom I was housesitting and they welcomed her with lots of love, which was really nice. However, I wasn’t really impressed with the food, unfortunately. In fact, for a vegan is reduced to a salad or a potato with some vegetables and tofu. I was full but not wowed by the choice. There was no other option. If you are vegetarian I guess you would be happier as you could add cheese and I presume for breakfast you would have a varied choice of pancakes eggs and other vegetarian options. If you are up for a simple salad, though you will be happy. Although I didn’t see any kinds of seeds or nuts to add on and enrich your healthy meal. Barra Light is closed on Sunday, while for the rest of the week opens from 8.30 to 19.00. They do have wi-fi. I loved my vegan pita kebab. This is a little place run by a very nice and friendly gentleman from Israel, named Alon, who loves to talk a lot. Therefore I really enjoyed my delicious pita there while talking with him about life and Mexico and vegan food. He is vegan too and the majority of the food he sells is vegan. 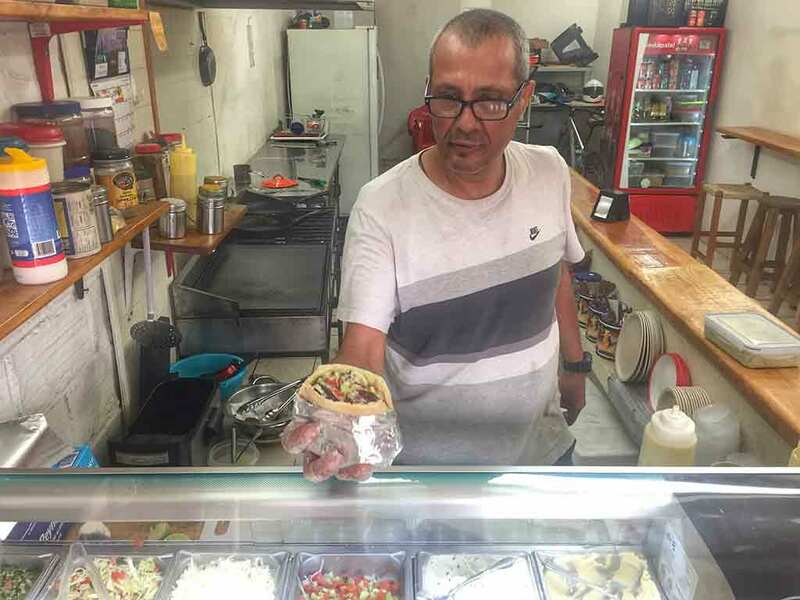 However, he says, with a reason, that in order to serve a bigger portion of the population he needs to have a couple of dishes with meat for those who want the original kebab. Other than that, it’s al totally vegan and he keeps separated dishes and cutleries. Oh! the tamarind water that he makes is special too. The place is simple but cozy you can eat there or take away and they also do delivery service. Open from 8 to 20 every day and have wifi. A very friendly place in the Zona Romantica at a few steps from the beach with outside and indoor sitting ( no air conditioning). The menu offers a variety of dishes based on rice and quinoa. All of them can be prepared in the vegan and vegetarian options. 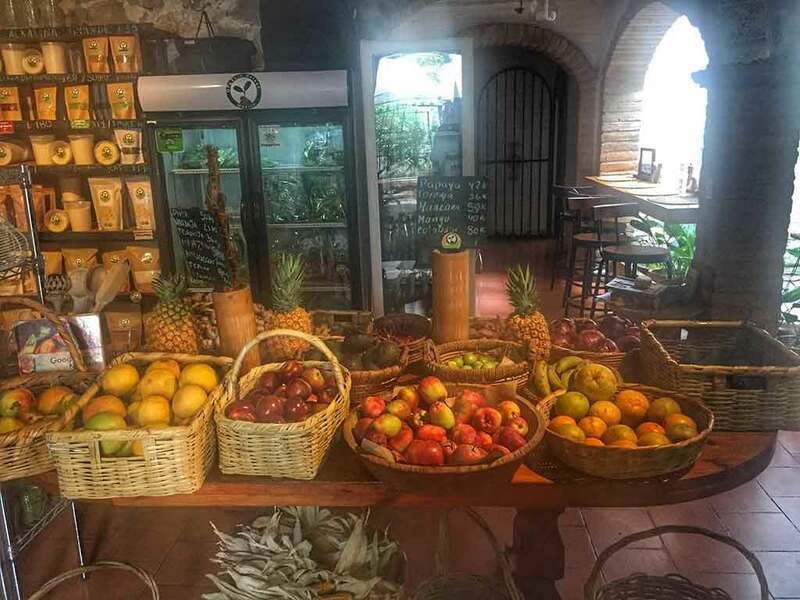 Salud superfood is also a popular place for its breakfast bowls and smoothies or juices. They have wifi and are pet-friendly. I enter with my doggie girl and she was more than welcome with a pot of water to keep her cool in such a hot weather. Both staff and owners very attentive and super nice. Open from 9 to 5 every day except Sunday. It’s a tiny lovely place located in a non-touristic area but still at a walking distance from the main road in Hotel Zone. It’s actually an organic and superfood shops most of all offering organic vegetables, eggs and well, yes chicken, plus all sorts of seeds, herbs, and corporal products. They have also a little cafe’ where they do sandwiches and salads and other simple dishes. They do have vegan options also for dessert. I have actually tried a mini muffin which was great and I took home a huge portion of vegan brownie which didn’t make it to the following day. It was absolutely amazing. You can take away but if you have time there is a lovely patio there where you can enjoy your meal in the shade. The staff is lovely. Oh! they make also a great “focaccia”. I haven’t personally tried it but I went to check out the menu. The place is nothing special but apparently, they have great food as it was very busy. 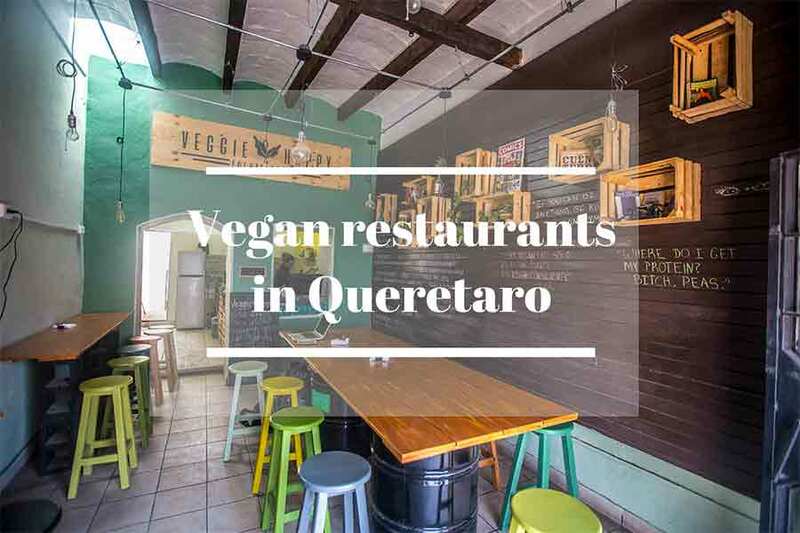 While reading the menu, I couldn’t understand why it had been suggested to me as a plant-based restaurant as the menu was totally based on fish, the majority being ceviches and tostadas. I asked the kind waiter and he told me that all the dishes can be prepared as vegan substituting the fish with different kinds of vegetables depending on the texture they want to create. That sounds very interesting and definitely something different to try. I have been suggested this place as the new cool place that everybody is talking about and I went to check it out. It’s a lovely little shack on the road, with 3 tables on the side so that you can take away or eat there. 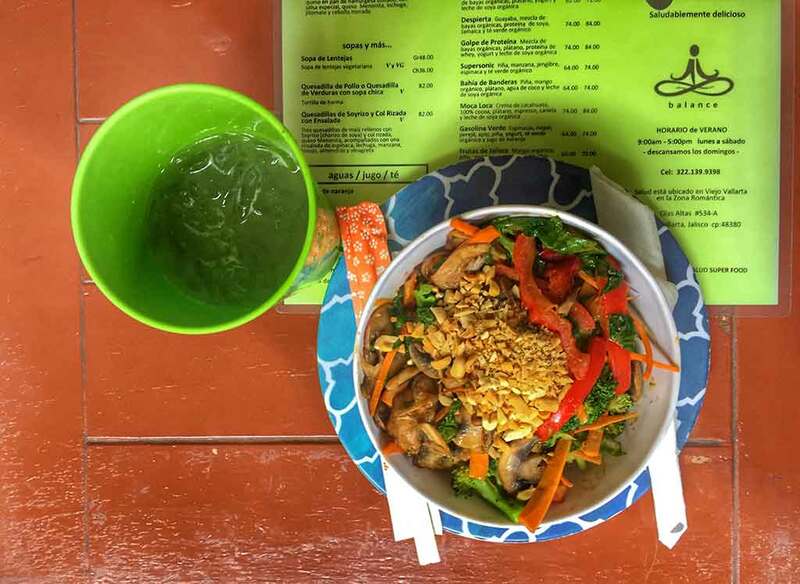 The menu is mainly fished based bowls of salads with curious combinations of veggies, fruits, and seeds but you can have your vegan one as well. The name is quite deceiving. The place is great, nicely decorated with comfortable tables and chairs, and a co-working area where you can purchase your membership and spend your day working in an air-conditioned tranquil space. However, the huge menu is quite disappointing if you like to eat healthy. You would read cheese, cream, chicken everywhere and there is no hint of vegan options. I am sure if you ask they can make you a salad with no meat or cheese. There are smoothies (with yogurt) and juices though. I had a lemon and mint juice on the rock which was great, though. Unfortunately I didn’t have the chance to check them all out, but I wanted to list them here for your information with the link to their own fb page. I hope it comes handy! Looks delish and I will definitely check it out before leaving Vallarta. This is in Sayulita and I haven’t tried it unfortunately, but it has all the good reviews. Definitely worth a try.